Signing of the Lord’s Prayer: Grade 3 Students – St. Mark the Evangelist Catholic School, Durham Catholic DSB. Trustees had an overwhelmingly positive response to this year’s OCSTA Annual General Meeting and Conference according recent survey results. This year’s theme – You Raise Me Up! Trustee Leadership and Ontario’s Catholic Schools, aptly describes the goal of the OCSTA Conference Committee. Under the leadership of Conference Chair, Trustee Colleen Landers, the Committe developed a program designed to offer a content rich professional development opportunity that would at the same time inspire Catholic trustees. 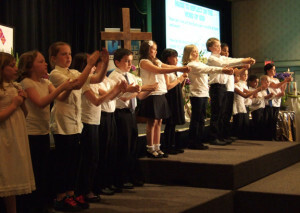 To set the context for delegates at this year’s Conference, trustees, staff and students from the Durham Catholic District School Board planned a unique and moving opening liturgy. Through scriptural readings, presentations and songs, the Opening Liturgy for this year’s Conference profiled the role of Gospel focused leadership in our biblical history and in our lives today. 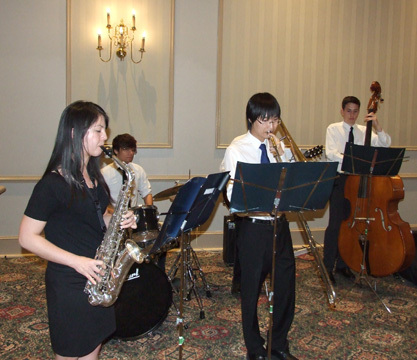 OCSTA would also like to thank the St. Aloysius Secondary School Jazz Combo from the Dufferin-Peel CDSB. This exceptional jazz ensemble provided music for delegates during the Annual Dinner Reception. To view the full program for this year’s AGM & Conference please click here. Elections were not held for OCSTA’s Executive Officers as the existing officers are serving terms that will expire in 2014. 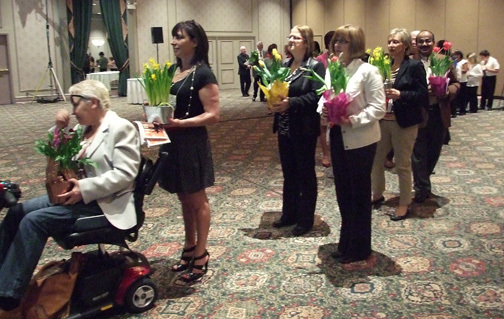 President, Marino Gazzola, Wellington Catholic DSB; Vice President, Kathy Burtnik, Niagara Catholic DSB and; Past President, Nancy Kirby, CDSB of Eastern Ontario. 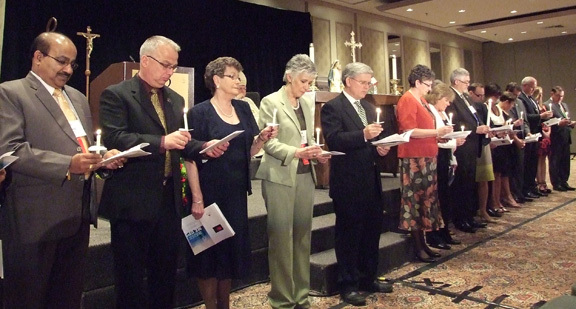 Trustees from the Durham CDSB and OCSTA’s Board of Directors participate in the Conference Opening Liturgy. 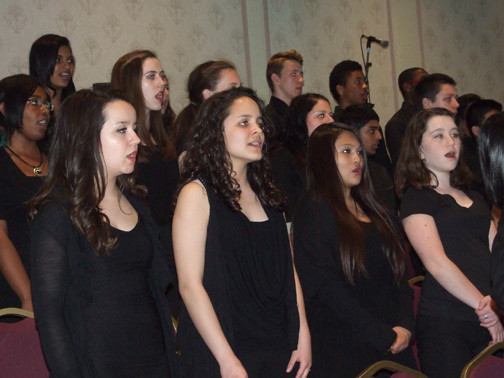 Members of the St. Mary Catholic Secondary School Choir sing “You Raise Me Up!”. 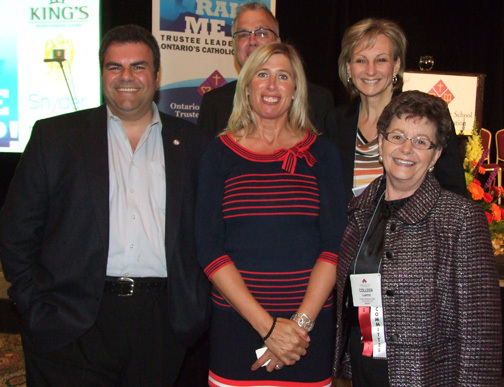 Opening night speaker, Canadian Olympic Champion and Author, Silken Laumann (centre) with OCSTA Directors, (l-r) Sal Piccininni, Paul Landry, Anna da Silva and Colleen Landers (Conference Chair). 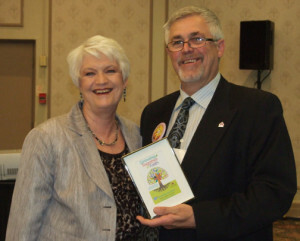 OCSTA President, Marino Gazzola present’s Ontario’s Minister of Education, Liz Sandals with a Catholic Education Week prayer card. 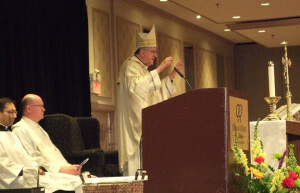 His Eminence, Thomas Cardinal Collins. 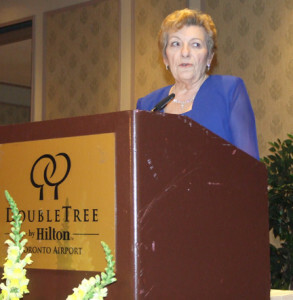 Trustee Award of Merit Recipient, Betty-Ann Kealey, Trustee, Ottawa Catholic School Board. OCSTA Trustee Award of Merit Recipient, Gerald Beerkens, former Trustee, Huron-Superior CDSB. 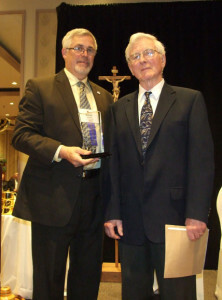 OCSTA Special Award Recipient, James G. McCracken, retired director of education for the Ottawa Catholic School Board. TVO’s The Agenda Host, Steve Paikin. 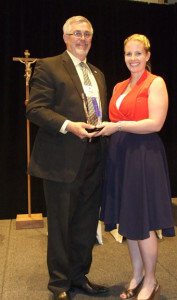 OCSTA Special Recognition Award Recipient, Nancy Bodsworth. Nancy is the composer and performer of the annual Catholic Education Week song and a teacher with the Dufferin-Peel CDSB. As part of OCSTA’s efforts to engage the Catholic community and the province in activities that raise awareness about the valuable contribution of Catholic education to the life of this province, the Association continues to promote the campaign “Faith in Our Future” (more information is at www.faithinourfuture.ca). 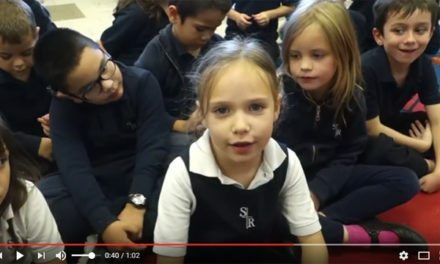 One of the most popular activities arising from this campaign is the short-video contest established for students in Ontario’s Catholic schools. The second Faith in Our Future Short Video Contest for Catholic schools attracted tremendous attention and participation by students and staff across Ontario. 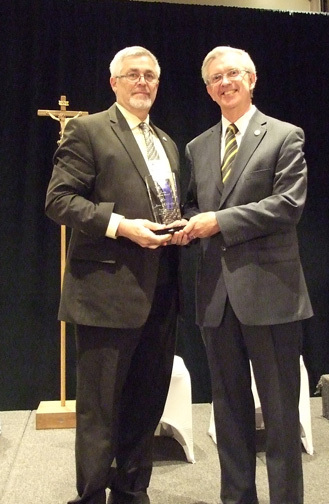 During the 2013 Annual General Meeting, OCSTA President, Marino Gazzola presented awards for the top 3 short videos from the elementary and secondary panels. All videos can be viewed at the links below or directly on YouTube (search for “OCSTAVideo1” to find the OCSTA video channel). At this year’s AGM staff members Sean McDade (Learning Coordinator/Technology Integration) and Lori Lynn Stapleton (Learning Coordinator – Religious & Family Life) from the Huron-Perth Catholic District School Board delivered an innovative presentation that examined a unique technological approach that leverages technology to promote a community of prayer. Following is an article from the Huron-Perth Catholic DSB that provides insight into this recent and successful board initiative. 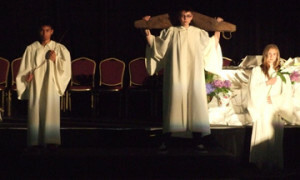 The MOOC was created for the entire Huron-Perth Catholic District School Board community to participate in during Lent: including students, staff and parish. The goal was for people to pray and learn together as a community in an online forum. A Massive Open Online Course (MOOC) is an online course aiming at large-scale participation and open access via the web. MOOCs are a very new area of research in distance education and are being adopted by institutions such as Stanford, Harvard and MIT. Typically they do not charge tuition fees and are not offered for credit. The concept for the Lenten MOOC was brought to Huron-Perth by Sean McDade, Learning Coordinator of Information Technology, who is currently working on his doctorate in Education Communication at Northeastern University. The concept made sense as a way to connect with the entire school system and offer a new way to experience learning. Sean commented that “…as a Board, we would love to have a community-wide prayer liturgy (for Lent), but because we are stretched over two counties, that is not a reality. 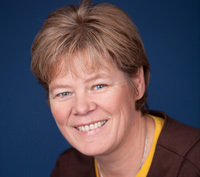 This MOOC is trying to overcome that limitation and present a new way to offer learning opportunities to students.” Sean brought the idea of the MOOC to Lori Lynn Stapleton, the Learning Coordinator for Religious and Family Life Education, who jumped on board and brainstormed ways to connect it to faith literacy. The course content of the MOOC included easy-to-access, ready-made lesson plans and activities on the 5 forms of prayer (adoration and blessing, intercession, petition, thanksgiving and praise). The lesson plans were broad and included a variety of mediums; pictograms, YouTube videos, French and English written content, and blogs, all related to prayer. Each week included daily reading and reflection questions. Online participation included students from grades K-12 co-creating class, small group, or individual prayers to be shared online and used across the system and in the parishes. 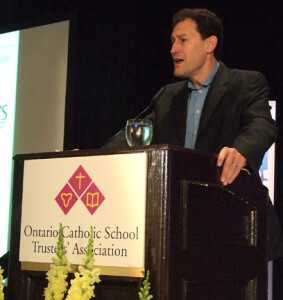 Lesson material provided in the MOOC augmented the Religion curriculum, and the board’s Faith Framework – the specific grade themes taught in the Religion program, as well as the Ontario Catholic Graduate Expectations. Sean and Lori Lynn were thrilled by the participation in the Lenten MOOC. Over the 5 weeks, 80 staff registered and 500 students logged on. One of the most significant events came about because of the Parish Connections section in the third week of Lent. The prayer petitions that students wrote on the MOOC were emailed to the local parish and priests were invited to use them during Mass as the Prayers of Intercession. There was so much participation, that it ended up as a 15-page document. Lori Lynn described it as a “great way to connect with the parish community and to connect faith to life”. An unexpected outcome was increased communication between schools. A grade 2-3 class at St. Mary’s Goderich posted comments on prayers by another class on the MOOC. The e-learning experience enables students to share with a variety of other students and opens the door to creative learning. Sean and Lori Lynn expressed appreciation to the Ministry of Education for providing this platform to the school as a gateway to critical thinking. Sean describes the MOOC concept as “a meaningful opportunity to unlock the potential of students”. He points out that it comes down to basic communication theory. “The memorable content of the course ends up being the ideas and thoughts of students as they collaborate with the material”. The positive experience has lead Sean to envision more adaptations of the MOOC and he has lots of ideas of how Huron-Perth can leverage the online learning in different ways. He commented on the prospect for a junior division sports writing MOOC as an innovating exciting opportunity for kids to connect or the creation of a regional magazine to extend and customize learning. Lori Lynn can see extending the content of the MOOC for next year and making explicit connections to the newly developed elementary Religion Policy document, especially referring to the ‘Praying’ strand. The success of the experience has led to exciting opportunities to share with others. Sean and Lori Lynn have been invited to present at two conferences in Toronto: an e-learning conference called On the Rise, and the Ontario Catholic Trustees Association AGM. Their findings of the Lenten MOOC come from a faith-based and 21st century perspective. Lori Lynn describes the invitation as a fantastic opportunity to share the mission of the Huron-Perth Catholic School Board and how they are progressive in integrating faith and technology. 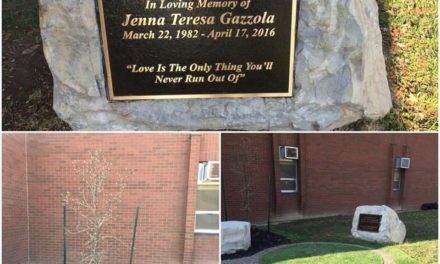 Students now recognize her as the “lady on the MOOC”, and one individual commented to her that it was “pretty cool to share prayers”. Clearly, if you can appeal to students, you are on the right track.